The ferries on the East River in New York, known as NYC Ferry, take you cheaply and easily to and from Manhattan. Do you want to visit Brooklyn or Queens? Or are you staying in a hotel in Long Island City? Then cross the East River on a ferry and get great views of the skyline along the way. The ferries are a nice alternative to the, often busy, subway. 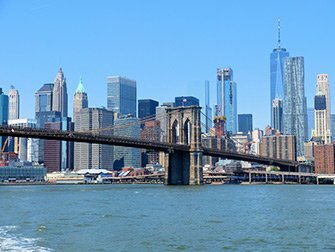 With NYC Ferry you travel for the same price as the subway with the added benefit of the Manhattan skyline views during the journey. 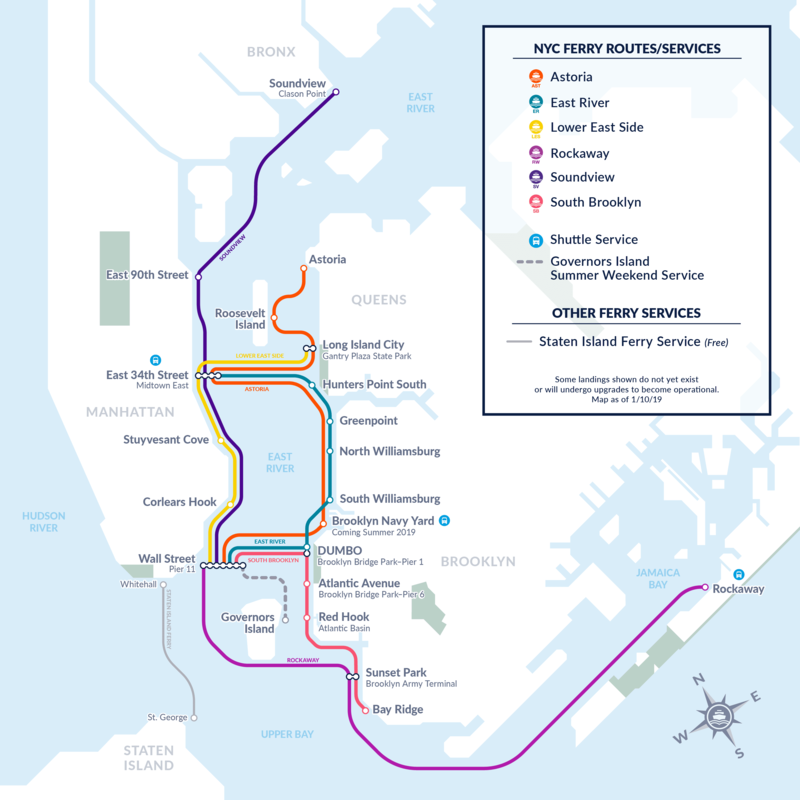 NYC Ferry operates six set routes throughout the year: the East River Route, the Astoria Route, the South Brooklyn Route, the Rockaway Route, the Lower East Side Route and the Soundview Route. For a breakdown of these routes and their stops take a look here. There are five docks in Manhattan, at Wall Street/Pier 11, Corlears Hook, Stuyvesant Cove, East 34th Street and East 90th Street. In addition, there are a variety of stops in Brooklyn and Queens. 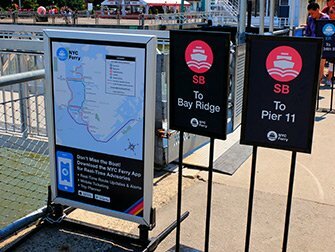 Throughout the summer season there is an additional, weekends only stop at Governors Island on both the East River and the South Brooklyn Routes. 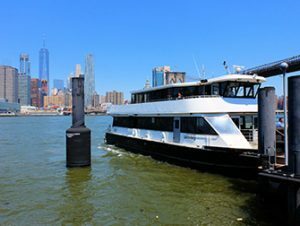 Tickets for NYC Ferry cost $2.75 per ride and can be purchased from the ticket machines which are located at each dock. Tickets are also available via the NYC Ferry app. 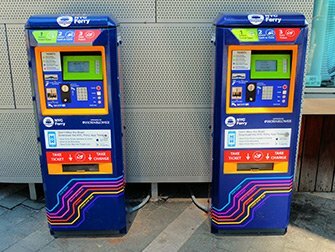 The cost of taking the ferry is the same as taking the subway, however, subway tickets can not be used for the ferries. The ferry service is certainly a nice addition to the subway. Do bear in mind that the boats are less frequent than the subway, so you may have to wait a little longer. The ferries are also commonly used by commuters. Therefore, I recommend avoiding morning and afternoon rush hours as the rest of the day is much calmer. 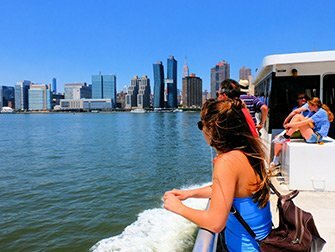 On the various NYC Ferry routes you can combine travelling from A to B with sightseeing. It is really nice to sit onboard a boat and enjoy the view, especially in the summer. Consequently, there are some routes where I would definitely recommend taking the ferry instead of the subway, at least once. NYC Ferry makes it easier to combine a visit to Lower Manhattan and the Financial District with a walk over the Brooklyn Bridge. One option is to take the East River Ferry or the South Brooklyn Ferry from Wall Street to DUMBO. From there, see the skyline from Brooklyn Bridge Park and walk back over the bridge to Manhattan. Or, if you have trouble walking, you can take the subway from Manhattan to Brooklyn and the ferry back. That way you don’t need to walk over the Brooklyn Bridge, but you do get the same great view. 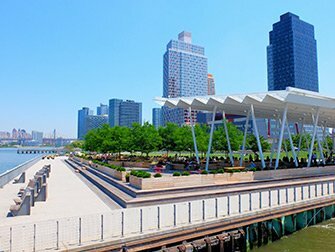 If you are staying in a hotel close to the Long Island City dock (at Gantry Plaza State Park), you can get to Manhattan faster on the Astoria Ferry than you can travelling by subway. Is your hotel closer to a subway station? Then the subway is probably quicker, but I recommend changing it up and taking the ferry at least once. You can also get from Long Island City to Roosevelt Island on the Astoria Ferry. 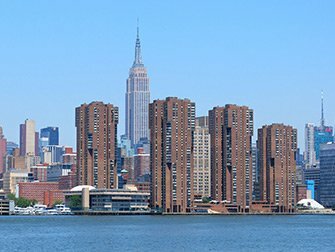 Are you visiting Roosevelt Island from Manhattan? Then take the famous cable car there and the ferry back. If you are planning on renting a bike in New York, you can make it an extra special experience by adding a ferry ride. Choose, for example, to pick up your bike at the Brooklyn Bridge. Then spend some time cycling the streets of Lower Manhattan before taking the bike on the ferry over to Brooklyn. This costs $1 on top of the normal ticket price of $2.75. Cycle through Brooklyn Heights and DUMBO and ride back to Manhattan over the Brooklyn Bridge. You could even make a day trip out of it and cycle from Williamsburg to Greenpoint. Then take the ferry back over to Manhattan, where you can cycle through Midtown towards Central Park and return your bike there. When you feel like having a beach day you can take the ferry from Wall Street to Rockaway Beach. In around an hour the Rockaway Ferry brings you from Manhattan to the Rockaway Beach peninsula, on the south side of Queens. It is a bit less touristy than Coney Island, for example. However it’s a nice place to visit in the warm summer months, especially in combination with the relaxing boat ride. Eric’s Tip: Depending on the departure point and destination, the ferry can be either faster or slower than taking the subway. However, in all circumstances, it is really fun to change it up and make use of the NYC Ferry at least once. A ticket is not expensive and you often get a great view along the way; a bit different from taking the subway! There are toilets on all ferries as well as a kiosk to buy coffee and snacks. Don’t confuse NYC Ferry with the free Staten Island Ferry! That only takes you to and from Staten Island.